Fussball DVD – leicht verständlich – perfekt präsentiert! Diese Fussball DVD ist für alle Trainer geeignet, die gute (mittelmäßige) Englischkenntnisse haben. Vieles erklärt sich durch die Videos. In 5 Schritten entwickelt Martin Bidzinski den Spieler, der mit beiden Füßen in jede beliebige Richtung dribbeln und passen kann. Maximize Playing Options by Developing the 360° Player. A training method that focuses on developing physically balanced players who are comfortable playing the ball with either foot to any direction. What does these exercises improve? Players to play quicker even when under pressure and in tight spaces. A soccer match is an ever-changing environment. With every movement of teammates, opponents or the ball a new playing problem is created, demanding each player on and off the ball to formulate and carry out appropriate playing solutions. Because most players rely almost exclusively on their dominant foot, their repertoire of solutions is obviously limited. Unfortunately, in many cases players are presented with training sessions that cater to their dominant side and their coaches rarely, if ever, train or even encourage the use of the weaker foot. – Author of the many Books and DVDs. 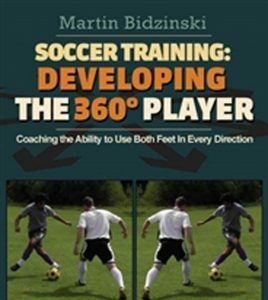 Martin Bidzinski has developed a training method that will give your players the repertoire of skills needed to play the fluid, attacking style of play known as: The First Ball Game. Teams like FC Barcelona, Arsenal FC and the national teams of Brazil, Germany and Spain have made their mark on the world of soccer by playing and winning with this attractive style, based on keeping the ball on the ground to feet and building the attack with skill rather than long balls and physical confrontations. 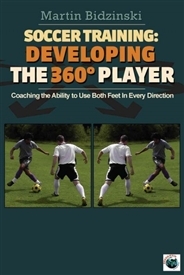 This DVD gives you all the tools you need to develop your plyers to 360°players.